Welcome to our Permetech Training Academy, our course provides you with the opportunity to expand your business offering the more popular resin bound and bonded system training for Driveways, Patios and Pathways to learn how to lay, we also provide discounts on materials brought through us when full Permetech training has been provided. On completion of our course, we will offer all aspects of the product, we guide you through how to lay the resin in a hands on training where you lay sample products that you can take away with you, showing you all of the tricks in the trade, a full guide on how to lay the resin bound and bonded system, all equipment needed to lay and mix, with Lunch and refreshments included. Permetech will also be available for any advice, or help in the future for your Resin Bound or Bonded surfaces. Permetech currently run courses on a weekly basis, with availability to suit you. 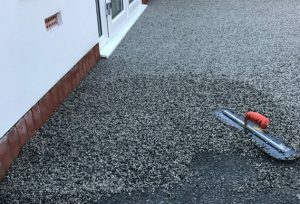 Permetech can also offer an option to lay the Resin Bound and Bonded system on a Fully Prepared surface for contractors, please do not hesitate to contact us for any questions or enquiries, if the option to lay the resin yourself isn’t for you.